The City of Pella offers a wide variety of athletic facilities. These facilities include the Pella Sports Park a 5 baseball/softball, and multi-purpose field complex, the Pella Soccer Complex an 10-field complex, with fields ranging from U6 to U19, 12 tennis courts, 6 pickleball courts and 3 residential ball fields. Fields and courts are available for ad hoc usage on a first/come first serve basis unless they are reserved. Please view field availability calendars or call 641.628.4571 for availability. For detailed information on our facilities, please use the links below. Pella Sports Park - Open for the season. Pella Soccer Complex - Open for the season. Tennis Courts - Open for the season. 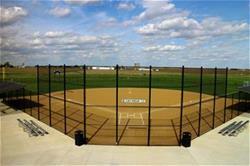 Residential Ball Fields - Open for the season. Caldwell Ice Rink - closed for the season. Pickleball Courts - Open for the season. The Pella community is fortunate to have a variety of athletic opportunities provided by local organizations, including the City of Pella's Community Services Department. Groups wishing to utilize City athletic facilities on a scheduled, ongoing basis must enter into a user agreement with the City. This includes any organized sports teams, groups or associations and those wishing to utilize city facilities for individual instruction sessions or clinics. Please contact the Community Services Office at 641.628.4571 for more information.